Landscape keyboard for email, text messages, etc. Spotlight search of email, address book, etc. … and lots more. The neat thing is, you can put the new iPhone software on an older iPhone– for free. It’s fine with me if you quit reading right now and go do it. 1. Connect your iPhone to your Mac with the USB cable. 2. Sync your iPhone (this creates a fresh backup). 4. Download the update and let Apple (and time) do the rest. Click here to see a list of the new features in iPhone OS 3.0 and to find out which of the features will work on your phone. 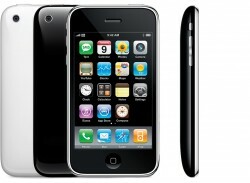 iPhone 3G S– it’s great!